« What’s at stake in a pastor’s denying the Virgin Birth? My new Advent series draws on ideas from Hamilton’s new book. 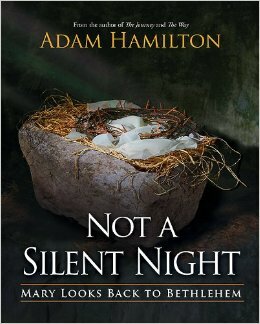 During Advent this year, I take a cue from Adam Hamilton’s new book, Not a Silent Night, and tell the Christmas story through Mary’s eyes. This first sermon in the series begins near the end—after the resurrection and ascension of her son Jesus. Although Mary only gets one mention in scripture after those events—in Acts 1:8-14—we can infer that she devoted herself to fulfilling the Great Commission. Her mission is our mission, too! Audio only this week. Click on the play button below, or right-click here to download .mp3 file. The following is my original manuscript with footnotes. There was big news in the world of entertainment last week, as we got our first glimpse of the new Star Wars movie, number seven in the franchise. Of course, when I was a kid, there were only three Star Wars movies. And at the end of the third movie, which we used to call Return of the Jedi, but is now more often referred to as “Episode VI,” the rebels defeated Darth Vader, and the Empire, and the “dark side,” and everyone lived happily ever after, as far as we knew. But now, guess what? The story wasn’t over after all. And in a voice-over, a menacing voice says, “There has been an awakening. Have you felt it?” I don’t know what has been awakened, but it sounds pretty bad. 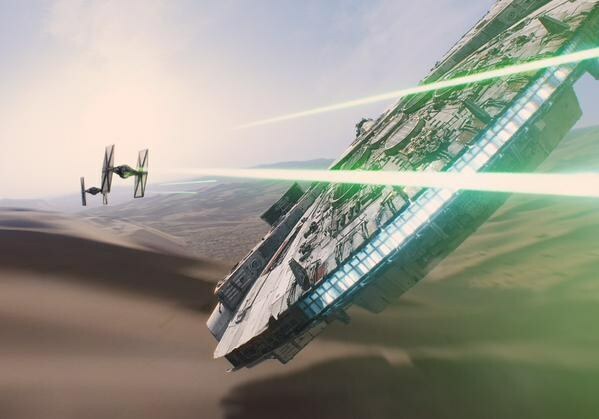 The point is, despite the happy ending in the previous movie, the Star Wars story continues—and will continue for at least three more movies. Wait… Began to do and teach? If that’s he case, then Luke is implying that Jesus will continue to do and teach in the Book of Acts. How is that possible? Jesus only has a cameo in the Book of Acts. Here in chapter 1 and when he appears to Paul in chapter 9. Well, sticking with our Star Wars theme for a moment, Jesus is sort of like Obi Wan Kenobi in Star Wars Episodes V and VI. He’s always there, but he works behind the scenes, often invisibly. How does Jesus do this? Jesus tells us in verse 8: “You will receive power when the Holy Spirit has come upon you, and you will be my witnesses in Jerusalem and in all Judea and Samaria, and to the end of the earth.” Jesus continues to do his work and teach his disciples through the Holy Spirit. And if that was true for the disciples in the Book of Acts, it’s true for disciples today. Hampton UMC is the sequel to this story. You and I are the sequel to this story. Some churches today even refer to themselves as “Acts 29” churches because they see themselves as continuing where Acts 28 leaves off. The inspired author of the Book of Acts would agree! As Adam Hamilton says in his new book, Not a Silent Night, we need this reminder, especially at Christmastime, when it’s so easy to forget what Christmas is all about! We forget the true meaning of Christmas! And Hamilton gives a chilling and tragic example of this kind of forgetfulness—our amnesia about Christmas. In 2008, a Walmart employee in New York named Jdimytai Damour was about to open the doors to the store on Black Friday morning. A crowd of 2,000 people grew impatient and busted down the door, which fell on top of Damour. Hamilton writes, “Some stepped over him, and some stepped on him. Even knowing he was hurt, people went on with their shopping, buying Christmas presents, making sure they got what they had waited for.” Jdimytai Damour died on the scene. Hamilton calls this a fitting symbol for the way ordinary people forget the meaning of Christmas. Which is why we need Advent. “Advent,” he says, “is the church’s response to this amnesia.” It’s a four-week period during which we prepare our hearts to celebrate the birth of our Savior. In order to help us prepare our hearts for the next four weeks of Advent—which ends on Christmas Eve—I that Hamilton uses in his new book: to invite us to look at Christmas though Mary’s eyes. And like Hamilton, I’m going to tell this story in reverse: starting at the end of Mary’s life and working backwards until we get to the birth of her son on that first Christmas recorded in Luke chapter 2. Mary and Jesus’ brothers were there. This is an interesting detail because of what we know from the gospels. In Mark 3, for instance, after Jesus moved away from home, began his public ministry, and his fame began to spread, Mary and Jesus’ brothers think that Jesus is “out of his mind.” That’s what the Bible says! They think he’s gone crazy, because he’s not behaving the way a good son is supposed to behave—it’s hard for us to imagine in our day, when children grow up and move away from their parents and family all the time, but this wasn’t done back then. Jesus was expected to be back home in Nazareth, with the rest of his family, supporting them, working in the carpentry shop, carrying on the family business—not going all over Galilee preaching, teaching, and healing. Whatever Mary thought of the angel Gabriel’s announcement to her 30 years earlier that she would give birth to the Savior and Messiah, whatever she thought of the virgin birth, whatever she thought of the shepherds’ visit and the Magi’s visit, whatever she thought of Jesus’ turning water into wine, she clearly didn’t think that Jesus was doing what he was supposed to do now. In other words, she doubted. And we also know that Jesus’ brother James doubted . Yet we also know that James, the author of the Letter of James, became the main leader of the church in Jerusalem. We know for sure that he willingly laid down his life as a martyr because he believed so strongly that Jesus, his half-brother, was Lord, Savior, Messiah, and Son of God. So what accounts for this dramatic change—that unbelievers like James and Mary would change their minds and become believers in Jesus? One thing and one thing only: the resurrection of Jesus. A lot of modern-day Christians think that we just have to take on faith that Jesus was resurrected, that we don’t really have any historical evidence for it. While I agree that ultimately it requires faith to believe in the resurrection, it’s hardly blind faith! In fact, we have quite a bit of historical evidence that the resurrection of Jesus happened. I’ve just shared one piece of evidence: We can prove, using the same methods that historians use to prove things, that a skeptic like James became a Christian because he sincerely believed that he encountered the resurrected Lord. We can prove that Paul, at first a persecutor of the early church, became a Christian because he believed he encountered the resurrected Lord. Not only did Paul and James believe it, they died for their beliefs. And because both of these men were considered “hostile witnesses” who later changed their minds, this counts as evidence for the resurrection. Jesus was crucified, that he died and was buried, and that on Easter morning the tomb was found empty. We can prove that Jesus’ disciples and friends and in fact hundreds of other people believed that they met Jesus after the resurrection. And again, the disciples believed it so much that they died for that belief. That’s real historical evidence. But there’s so much more: Several years ago, I was watching an interview with the celebrity atheist and best-selling author Richard Dawkins , and he was asked what accounts for Jesus’ disciples claiming that Jesus was resurrected. And Dawkins said, “Oh, well, in the ancient world, when charismatic leaders died all sorts of legends would spring up about their coming back to life.” And Dawkins is actually completely wrong about this. There are no historical parallels between what the early Christians said about the resurrected Jesus and ancient myths and legends. In fact, there were dozens of charismatic, would-be Messiahs within a hundred years of Jesus, before and after, who led revolutionary movements against Rome. And all of these leaders, like Jesus, were killed by the Romans. Yet none of their followers claimed that their would-be Messiahs had come back to life, much less been resurrected. Only Jesus! And, contrary to Dawkins’s assertion, if the resurrection were a legend, it would take years—decades even—for a legend like that to develop. And we can prove, historically, that the disciples believed and proclaimed the resurrection of Jesus from the very beginning. I’m just getting started. The point is, no competing theory comes close to explaining what happened on Easter Sunday better than the fact that Jesus was bodily resurrected. And resurrection explains why Mary and James became believers and were part of this earliest church gathering. Well, it’s one thing to talk about why we believe in the resurrection; it’s another to say what it means. Adam Hamilton points out that his church, the Church of the Resurrection in Kansas City, has a special service each December remembering loved ones who died over the past year. That’s very appropriate, he says, because Christmas ought to remind us of Easter—of resurrection—that Jesus came into this world in part to defeat our greatest enemy, death itself. Speaking of Christmas, my dad died of cancer at Christmastime back in 1995. I have a couple of vivid memories related to the holidays that I want to share. It was Thanksgiving of that year, and we had family over at my parents’ house. And Dad was still mobile at that point. He could walk around a little. And I remember the house was cold and Dad got up to adjust the thermostat, only it wasn’t working properly, and I remember him banging his fist on it in frustration. And he was really struggling… he wasn’t himself at all. And I watched this, and went down the hallway to my bathroom, closed the door, and just lost it. I knew he was dying. I knew this was nearly the end. And you know what? It stunk. I hated what was happening to him! Then I remember maybe a week later, decorating Mom’s Christmas tree. Dad was too weak to help, obviously. But when we were finished, I helped Dad to his feet and walked him over to the living room to look at the tree. And then I thought, “This will be the last Christmas he lives to see.” Only it wasn’t, because he died three days before Christmas. And that just stunk! Death is the worst enemy. Sometimes when people die, especially when they’re in pain, death can come as a relief when it finally comes. That’s not what I’m saying: it’s the fact that people die, and that death has the power to rob us of everything. The last couple of months of Dad’s life he had a feeding tube into his stomach. He had a catheter bag. He was mostly bedridden. He finally went on hospice care. I’ve told you before that he had a conversion experience before he died. He died at peace with God. I know that for sure. For weeks after he died, I had these crazy vivid dreams of Dad. In these dreams, he seemed as real and as present to me as any of you. And every time I saw him in these dreams, he would be walking around, like a healthy person—without the catheter bag, without the feeding tube. His color had returned to his cheeks. He was smiling—beaming. And every time I had these dreams I would say to him, “Dad, what are you doing up? You need to go back to bed. It’s not good for you to be walking around like this.” But he insisted that he was O.K. I’m not saying that I was encountering Dad’s ghost or anything. But I think this was God’s way of showing me that Dad was O.K. And that when I saw him again, in person, on the other side of death and resurrection—in heaven—this is how Dad will be. All the life, all the vitality, all the energy, all the strength that cancer and death had stolen from him—all that would be restored to him. Dad will have new body—an imperishable one, an immortal one—one that is incapable of suffering disease or decay—a body, as Paul says in 1 Corinthians 15, much like the one that Jesus has in his own resurrected body. One way we overcome our amnesia at Christmas is by remembering Easter. Christ came into the world to defeat death. Isn’t that great news? Jesus had told his disciples to be light to the world. He had told his followers to each others what he had taught them. He had told them to be his witnesses. Don’t you imagine this is what Mary did during the last days of her life? I believe she would have continued to do the things Jesus had done—to look for people who were lost sheep and bring them back to God; to find those who were hungry and thirsty and sick and naked and in prison and care for the; to let her light so shine before others that they might see her good works and give glory to her Father in heaven; to love her neighbor and love her enemy and do the things Jesus had called all the disciples to do. Wouldn’t Mary have devoted the next fifteen years of her life to doing those things? How are we doing as Christ’s witnesses? At the end of the first chapter, Hamilton returns to that Black Friday Walmart tragedy to ask us consider how many of those 2,000 shoppers at the store that morning were Christians? Eighty percent? Maybe 1,600 of them—if you asked them—would say that they’re Christians. Seems like a reasonable estimate. How many stopped to help this dying man? Three. Exactly three set aside their self-interest, sacrificed the chance to get a bargain, to get a door-buster deal, and try to save this man. It doesn’t seem possible, does it? Yet we’re probably not so different from those 2,000. Except that you and I are probably never going to be in a situation like at that Walmart—in which we’re literally leaving someone to die without offering to save them. But my fear is that we might leave people to die—spiritually—without attempting to save them. I wonder if we’re not doing that right now by failing to be a witness the way we know Mary was. By failing to love them, serve them, meet their deepest needs, pray for them—including to pray for their salvation. We all know people, for example, who haven’t yet made a decision to accept Christ as their Savior and follow him as Lord. Is there any more important decision that someone can make? Shouldn’t their salvation not be a top priority for us? What can we do for them? We can all do what we find Mary doing in today’s scripture, which is to pray for them! I’m preaching to myself, too. When I think about my own witness over the years, I’ve thought about not only those people I might have stepped over or left to die; I’ve thought about those people whom I’ve practically stepped on, walked over, or mortally wounded myself! All I can say is I’m repenting and getting better, by the power of the Holy Spirit. I’m not where I want to be, but God’s not finished with me. And he’s not finished with any of us. If you want to be a better witness for Jesus this morning, will you say Amen? Adam Hamilton, Not a Silent Night (Nashville: Abingdon, 2014), 16-7. This entry was posted on	December 10, 2014 at 3:57 pm	and is filed under Uncategorized.